Yesterday my Korean roommate and I went to the Korean supermarket in Auderghem. He really wanted to eat some noodles at a great Chinese restaurant nearby, but it was closed. 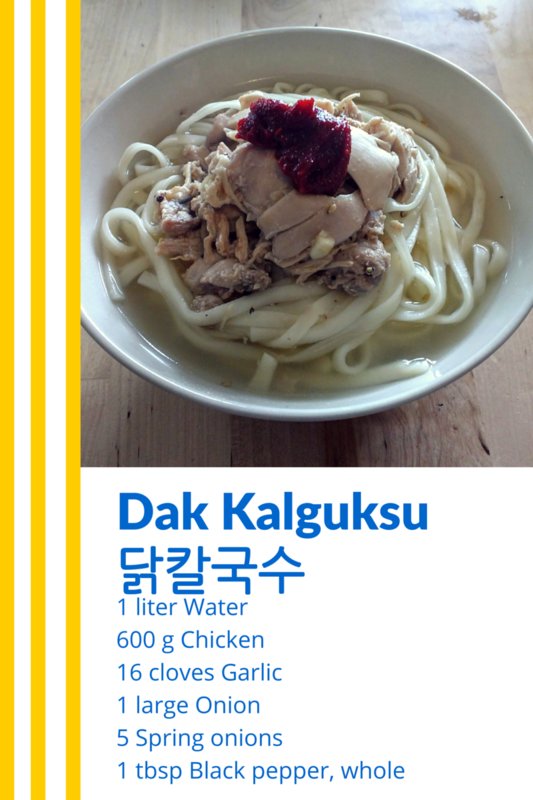 So today I made him dak kalguksu (닭칼국수), Korean chicken noodle soup. When it is warm, people in Korea like to eat warm things. You do not have too be surprised to see Koreans enjoying a nice hot bowl of noodle soups. It might be strange for you that they enjoy eating hot soups during hot summer days. Yet it is what it is. One of the noodle soups they enjoy eating on warm days is dak kalguksu (닭칼국수). 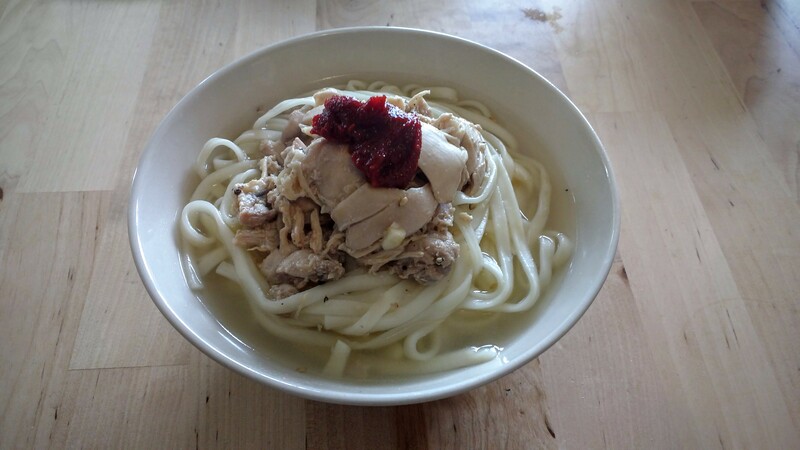 Dak kalguksu (닭칼국수) is a humble Korean chicken noodle soup. The name of this dish is based on the kind of noodles it uses. They are called knife cut noodles (칼 is the Korean word for “knife”). Noodles are made with wheat flour and eggs and after a period of resting, they are cut thinly using a knife. You can easily make the noodles yourself, but if you are among the lazy (guilty!) you can just buy them pre-made in your local supermarket. Furthermore, if you do not like garlic than this noodle soup might not be for you. It uses a lot of garlic. Really, it uses a lot of garlic. Great for those who enjoy that garlic taste, not so great if you do not enjoy it whatsoever. When making a soup you need to make sure to remove the leftover fat from the surface. This is especially when the broth is as clear as this broth. Some people would not bother with this, but removing it will make the soup look so much more appetizing and it does not take that long. The easiest way and my way is to use a mesh strainer and some paper towels. Place the paper towels inside the strainer and pour the broth over it. The paper towel will prevent anything but the soup from passing through. Afterwards use a spoon to really press the juices from garlic and other veggies into the soup for even more flavor. A simple, but effective method, no? 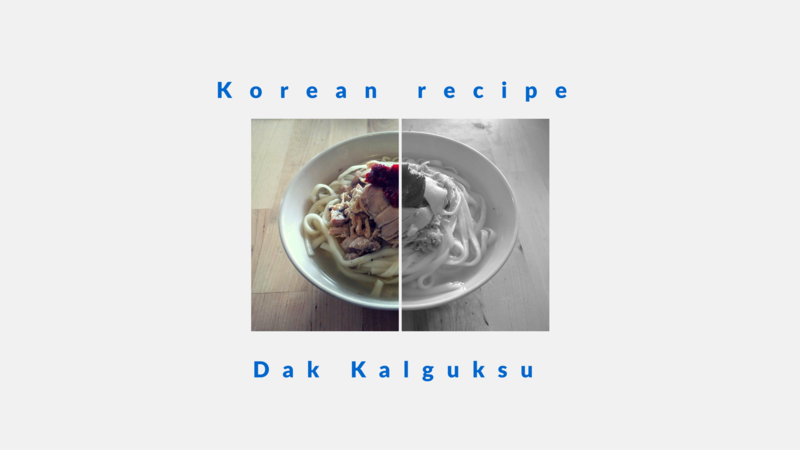 Dak Kalguksu (닭칼국수) is a simple chicken noodle soup. Actually you could even call it Korean chicken soup. This hot noodle soup is eaten during hot days. Wash the chicken using cold water. Peel the garlic cloves, cut the onion in half and the spring onions in smaller piece. Place the chicken with the garlic, onion, spring onion, ginger and black pepper inside a pot and pour in the water. The water should completely cover the chicken. Start boiling everything on medium heat and keep boiling for 1 hour. Remove the chicken from the soup and place it in a bowl separately to cool. Pour the soup with everything in a mesh strainer with kitchen paper to remove the oil. Use your hands to pull the chicken apart into small pieces. Season the chicken with soy sauce, pepper, sesame seeds, garlic and salt. Mix the korean red chili flakes with soy sauce, mirin, Korean fish sauce, water, pepper and sugar. Mix well until it becomes one liquid/paste. Place a pot of water on high heat and wait until it boils. Put the knife cut noodles in the water and boil it for around 7-9 minutes. When the noodles are done remove the hot water. Wash the noodles using cold water to remove any leftover starch. Reheat the noodles using the soup until the soup boils again. Serve the noodles with soup hot along with the seasoned chicken and a teaspoon of topping. Use a mesh strainer and kitchen paper to remove all remove all fat from the soup. A clear soup looks better. When removing the vegetables use kitchen paper and a spoon to remove all broth they have absorbed. You do not have to reheat the noodles in the broth, but it will result in a slight better taste. PS: If you want spicy noodles, why not try my rabokki recipe?